Remember Gobustan? Well it turned out that wasn’t the only bloggy thing I did that weekend. 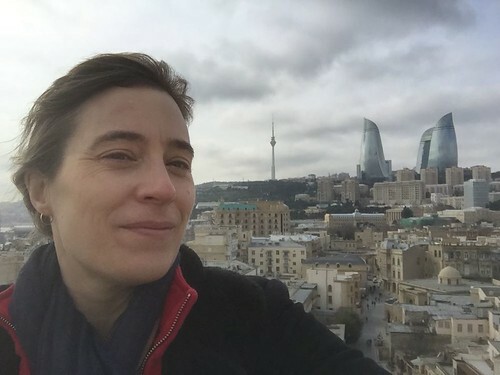 On the following Sunday, after carefully considering my To Do List, I quietly chucked it all and decided it was high time that I visited Baku’s most famous landmark, the Maiden Tower. The Maiden Tower as seen in pre-dawn darkness, on a morning run. 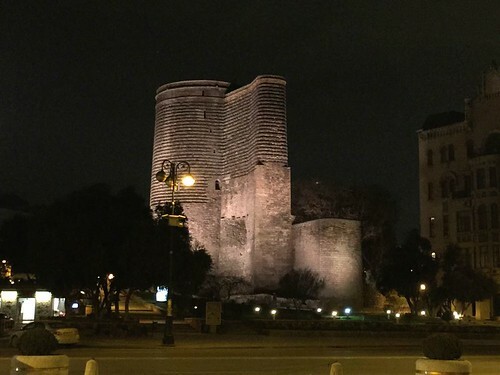 The Maiden Tower is possibly the most ubiquitous symbol of Baku, appearing on keychains, coins and bank notes, tea sets, commemorative plates, carpets, t-shirts, and just about anything else. It’s not the tallest tower ever - a mere 97 feet - but considering it was built in about the 11th or 12th century it’s pretty impressive. It’s also got a very interesting, massive buttress sticking out one side that some people say makes it look like a buta symbol when viewed from above. (Note “buta” is pronounced BOO-tuh.) The buta - a shape we in English call paisley - is very important in Azerbaijan culture. It’s often said that the buta represents fire, and considering that Azerbaijan means “land of fire”, you can see why it might be important. Butas appear as decoration on things a lot. Perhaps even more than the Maiden Tower, which is saying something. 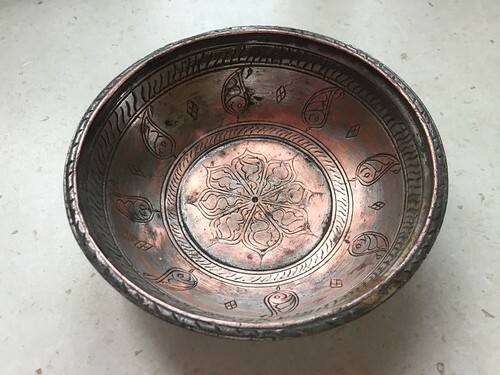 There are even butas on the little antique copper bowl I bought to corral my keys ad loose change near the front door. My copper bowl - spot the butas! Working with copper is another very Azeri thing, so I was really pleased to pick this up for 20 manat. Though I suspect I disgraced myself and seven generations of my ancestors by NOT haggling in the slightest with the vendor when I bought it. 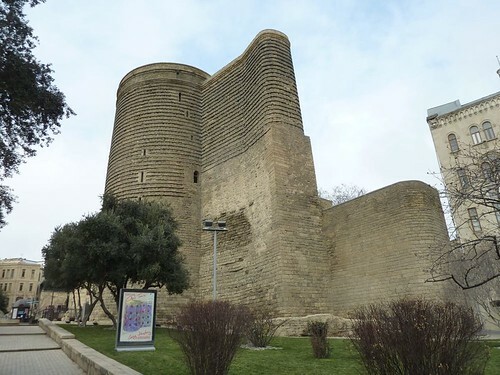 It is the law in Azerbaijan that when speaking of the Maiden Tower you are required to mention at least one of the various legends of why the tower is so named. The most boring theory is that the tower is “maiden” because it was never taken by force. Yawn. Much more interesting and dramatic is the tale of a king was trying to force his daughter to marry a man she didn’t love. As a stalling tactic, the daughter asked her father to build a tower so high that she could see all his lands from the top of it. When the tower was finally finished, the maiden climbed to the top and, rather than go through with the forced marriage, threw herself off to her death. Another picture of the Maiden Tower. Because, you know, it's a blog about the Maiden Tower. No one agrees on why the tower was built. 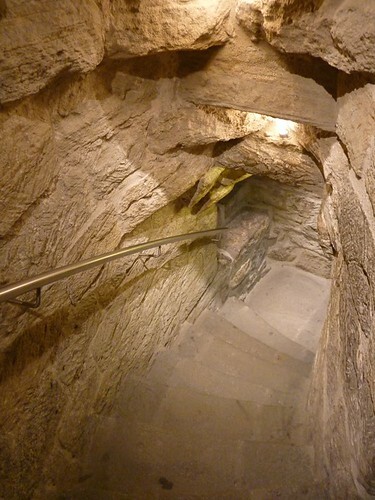 Some assert it was for defense and fortification, and it even has a hidden water well reaching to an underground aquifer, which makes it seem possible that it was meant to withstand sieges (it’s estimated it would house about 200 people). However, the lack of convenient military appurtenances like arrow slits and murder holes and such makes that debatable. Others say it might have been an observatory, pointing out the the orientation of the big buttress and some of the windows line up with the position of the sun on some equinoxes (though I watched a little video on that in the museum inside the tower and I’m sceptical). Still others speculate it was built for religious observances. And given the fuzzy line between science and religion for much of human history, it’s possible the observatory theory and the religious observances theory are not mutually exclusive. Like most structures of that era, the walls and foundations are massively heavy. Built into the sloping stone of the Caspian sea shore, there’s a theory that the big buttress is there to help stop the tower from toppling down the hill. 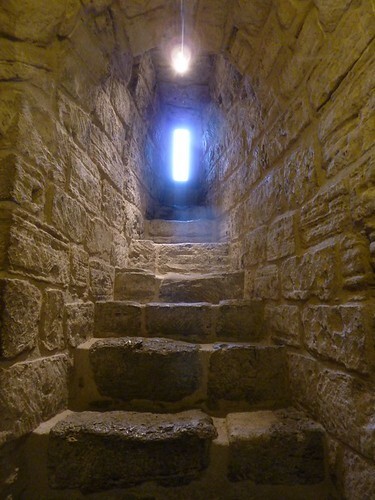 Besides being weighty, the fact that the walls at the base of the tower are 16 feet thick (and only taper to about 12-14 feet at the top) mean that what’s big on the outside is not particularly roomy on the inside. Here’s one of the few windows in the structure, with little steps leading up to it, illustrating the thickness of the walls. The stairs between floors are also built into space in the walls. The outside of the tower shows an interesting striped effect where, above a certain point, the stone is laid with alternating rows projecting past the face of the wall. Inside, it’s been highly restored. Prior to the 1960s the tower had been quite neglected - all of its interior floor were missing (historians think they were made of wood, so it’s not surprise they didn’t last), and swifts were nesting in the cracks in the masonry. 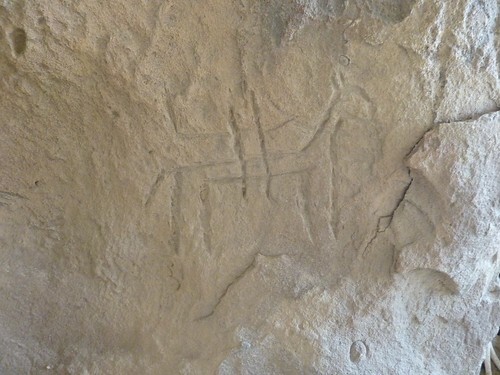 Archeological excavations took place in the 1960s, and in 2000 the site, and the neighbouring Shirvanshah's Palace (a blog for another day) were listed as UNESCO World Heritage Sites. It was threatened by a subsequent earthquake not long after and moved to the "List of World Heritage in Danger”, AKA the “This Place Will Be In Big Trouble If Somebody Doesn’t Do Something Pretty Smartly and We’re Really Not Kidding” List. Much more extensive renovations were done between 2009 and 2013 and the result is impressive. The missing floors have been replaced with stone, creating domed ceilings on each of the tower’s 8 floors. (Though if the floors were originally wood, it begs the question why they would be restored in stone, which, in fact, is not a restoration at all so much as a renovation. I suppose we should simply be glad they didn't also elect to add a nice conservatory or loft conversion.) Each floor has a few quite nice exhibits, with the mandatory moody lighting and touchscreens and clever use of see-through video displays. Not a touchscreen video display. Rather, a shot of the stonework in one of the stairwells, with a very nice brushed steel handrail. Most charmingly, those poor swifts whose nests were disturbed in the renovation work were provided with new condos just a short distance away. 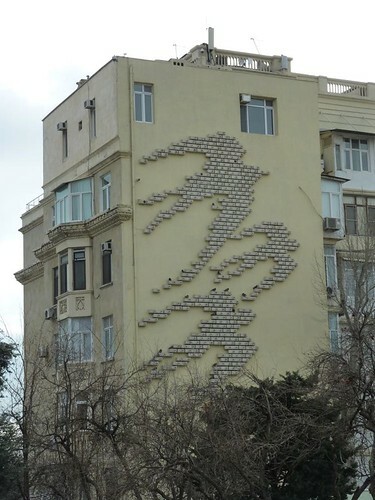 The whole side of a nearby building is covered with custom-design swift nesting boxes that are installed in particularly appropriate pattern. I’d wondered what those things were several times, and the answer is far cooler than I ever would have guessed. And of course there’s the view, which, despite the rather modest height of the tower compared with the architecture of modern Baku, is still pretty impressive. A wind-blown Pam, pictured with the Flame Towers, which are that trio of swoopy glass things on the right. Famous, those are, but also a subject for another day. 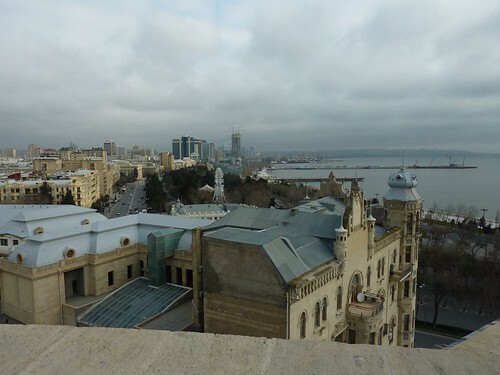 Because it's Baku, the top deck of the Maiden Tower is exceptionally windy, making it chilly to be up there for long. I took a mandatory selfie, then beat a retreat. You get three guesses as to where I went, and the first two don't count. That's right! It was a nice café where I could get a cappuccino and a pain au chocolat. Because there are rules about these things, and one of the rules is that diligent bloggable activity must be followed, wherever possible, with coffee and pastry. And we here at Go Stay Work Play Live are sticklers for the rules. Work work work. Have I mentioned it's getting busier? Probably. 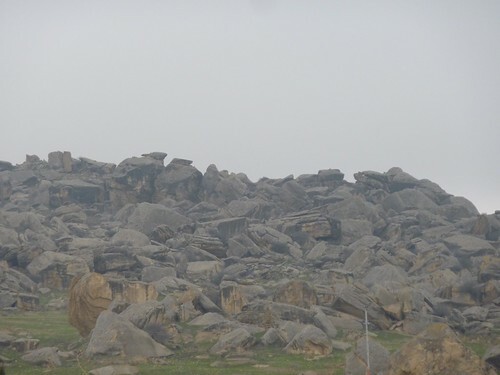 Nevertheless, I did manage to get out of the city to one of Azerbaijan's best-known sites this weekend. It was actually a work-related visit, but fun nonetheless because having a little road trip on a Saturday morning is not a bad thing. (Especially if there might have been a luxurious breakfast with coffee and pastries preceding the start of the journey.) It was also nice to bust out a Lonely Planet Guide again, which is something I do quite rarely these days. There's a small but quite new and decent museum where you pay the 2AZN admission fee to the park and get to play with touchscreen displays and look at dioramas of prehistoric mannequins with impressively luxuriant leg hair (sorry, no photos) before driving up to the rocks themselves. 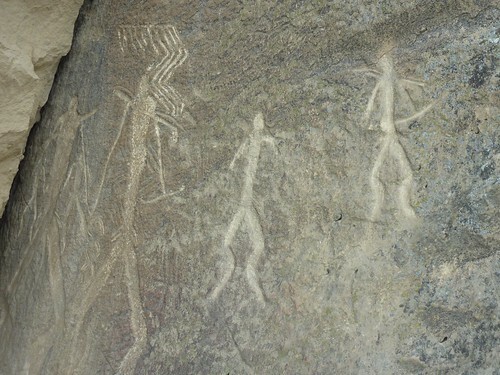 The petroglyphs of Gobustan date from between 5,000 and 40,000 years, which is sort of staggering and hard to comprehend. (That older than the Great Pyramids, Stonehenge and Betty White.) I've found this before, this problem when visiting historical sites where you just have no possible frame of reference for what you're seeing. The Parthenon... tough. The old city of Jerusalem... also not exactly modern. But this? How do you even begin to imagine the life of the people who did this? 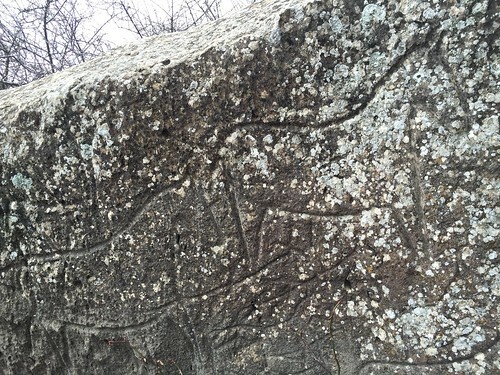 And, because we're all about educatin' the public here at Go Stay Work Play Live, please note that the word "petroglyph" refers to images actually carved into the stone, as opposed to ones merely daubed on with paint. Those are properly called "petrographs". 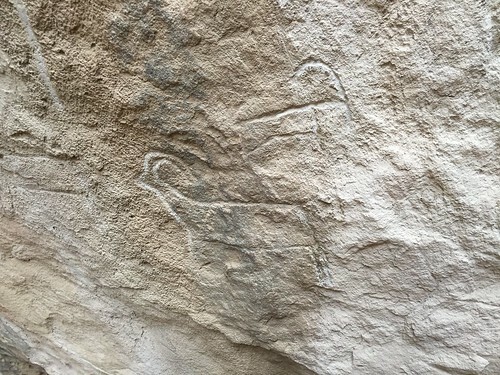 Apparently the petroglyphs of Gobustan extend over an area of more than 500 hectares, which includes about 6,000 carvings, along with "the remains of inhabited caves, settlements and burials, all reflecting an intensive human use by the inhabitants of the area during the wet period that followed the last Ice Age, from the Upper Paleolithic to the Middle Ages." (Wikipedia. Of course. I actually give them money every year now, because they seem to be the de facto repository of all human knowledge, plus this blog would be on even shakier ground than it already is without the work of the good people of the Wikimedia Foundation.) But back to Gobustan. We only saw the small area of the site that's easily accessible, with nice paved paths and helpful signs telling you where not to walk, because there might be snakes. See? I wasn't kidding. Though given the temperature, a slithery encounter was unlikely. This did not comfort Gerald. Despite the fact that we probably saw about 1% of the site, it was undeniably impressive. It was also neat because we pretty much had the place to ourselves and though the sky was grey and misty, it seemed sort of appropriate and added to the mystery. This was also mysterious. 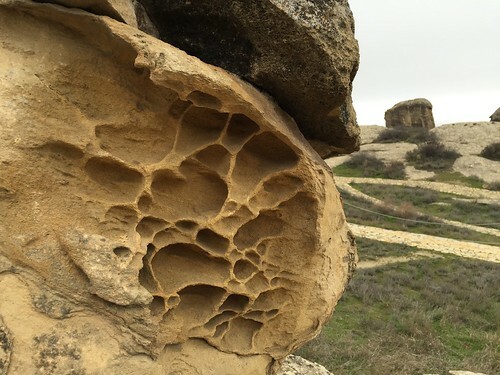 I'm guessing it's some kind of erosion, but how cool is this? There were rocks like this all over the site. 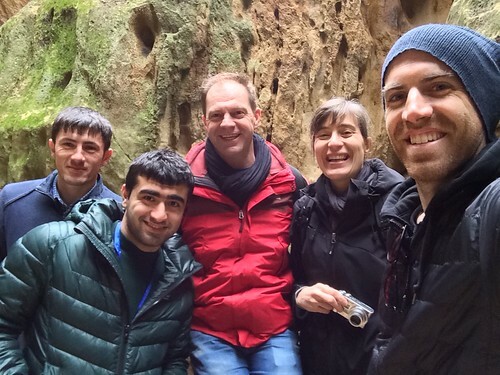 We weren't at Gobustan for long, but I'm glad we made the effort. And about 10km further down the road there's a collection of Mud Volcanoes, which are something I've never heard of before but which, unsurprisingly given the name, are small conical mounds that "gurgle, ooze and spit" and sometimes erupt with thick mud. Azerbaijan apparently has more than half of the world's total stock of mud volcanoes, which I'm guessing you did not know. 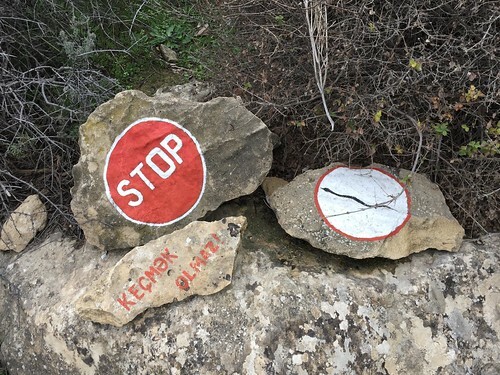 Sadly, that's as much as you will learn about mud volcanoes here, since we didn't go see them, opting instead to go back to Baku, which has walls and cappuccino, both of which we took advantage of as quickly as possible. I'm taking you all at your word that shorter blogs are better than no blogs, so that's all you get this time. I'll just mention that, as usual, there are more pictures up at Flickr, so check it out. And stay tuned. There's another Day Out in the offing, which, while it may not be as cool as mud volcanoes, will certainly involve more red wine.